The Pamir Mountains include some of the world’s highest peaks, soaring to heights of 7,300 meters (24,000 feet ). Centered in eastern Tajikistan, the Pamirs—part of the “roof of the world”—are home to thousands of glaciers. 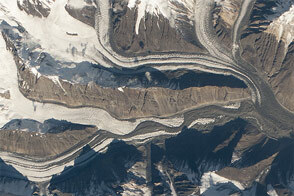 Among them is Fedchenko, which at 77 kilometers (47 miles) is the longest glacier outside of the Earth’s polar regions. The melt waters of Fedchenko Glacier feed into the Muksu, Vakhsh, and Amu Darya rivers before eventually making their way to the Aral Sea some 2,000 kilometers (1,200 miles) away. 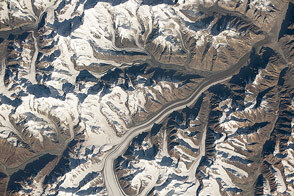 In arid central Eurasia, the snow- and glacier-covered mountains serve as the region’s water towers. Nearly 90 percent of the Central Eurasian population relies on water from the mountains for energy, agricultural, and drinking purposes. Throughout the glacier’s 77 kilometer course, it drops 2,500 meters (8,200 feet) in elevation. At the highest elevations, the glacier is snow and ice covered; but as it flows downstream, it picks up rockfall debris. Reddish-hued debris lines running parallel to the flow direction begin about midway down the glacier’s length. These medial moraines widen as the glacier descends. 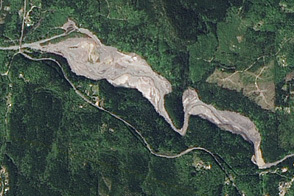 At its terminus, the glacier is completely covered by debris. Since 1933, Fedchenko Glacier has shrunk by 1,400 meters (4,600 feet), and Tajikistan expects to see the complete loss of many smaller glaciers in the coming decades. However, the full story in this region is more complex. 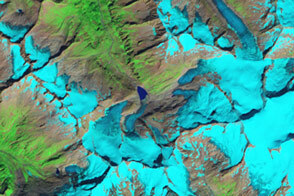 The changing climatic conditions responsible for the glacial melt have also affected regional precipitation patterns. The Global Precipitation Climatology Project has shown that precipitation over the eastern Pamir region has increased between 1979 and 2010. Researchers postulate that this increased precipitation will serve to stabilize large glaciers in the region, as increased snowfall adds to their ice mass and counterbalances the peripheral melting. In the Himalayas, where precipitation has decreased, the outlook for alpine glaciers is more dire. 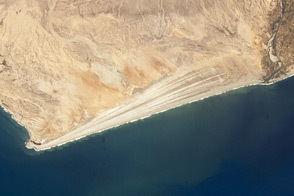 NASA Earth Observatory image by Jesse Allen and Robert Simmon, using Landsat data from the USGS Earth Explorer. Caption by Laura Rocchio, Landsat team. The Pamir Mountains contain some of the world’s highest peaks and the longest glacier outside of the polar regions. 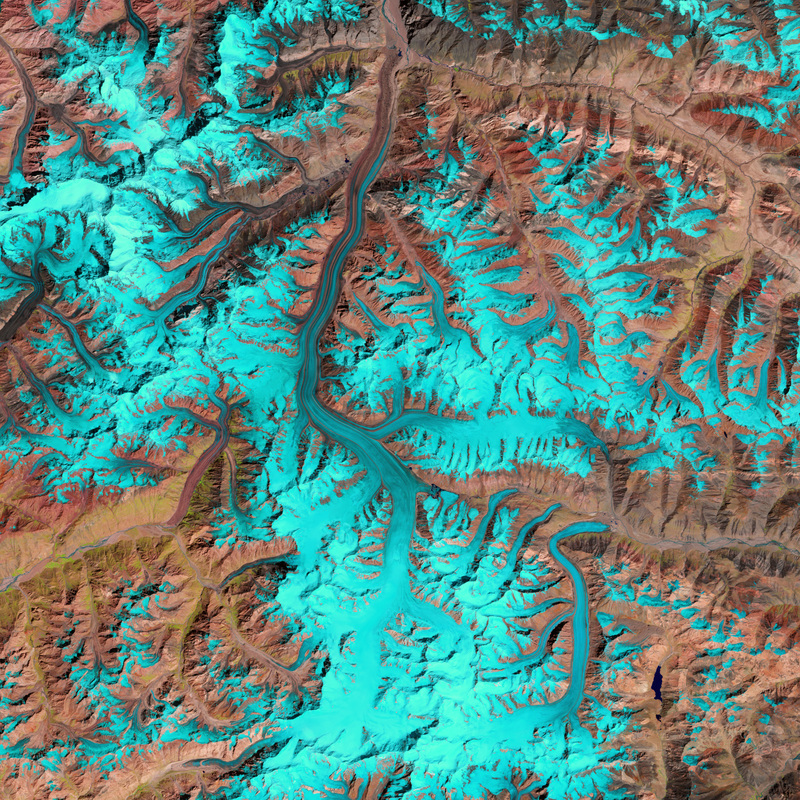 Iwata, Shuji (2009) Mapping Features of Fedchenko Glacier, the Pamirs, Central Asia from Space. Geographical Studies, no. 84 pp.33Ã¢â¬â43. Kotlyakov, V.M., Osipova, G.B., and Tsvetkov, D.G. 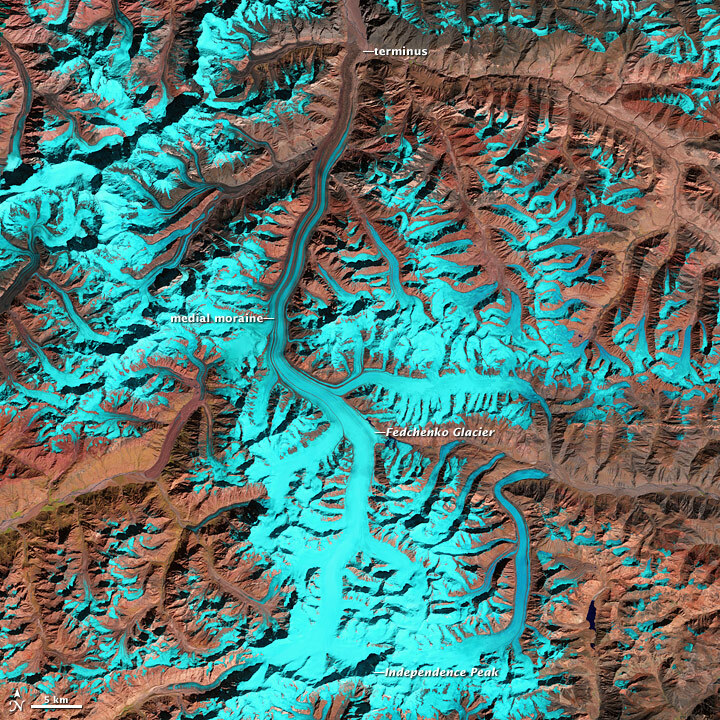 (2008) Monitoring surging glaciers of the Pamirs, central Asia, from Space. Annals of Glaciology, 48, pp. 125-134. Yao, T. Thompson, L., Yang, W., Yu, W., Gao, Y., Guo, X., Yang, X., Duan, K., Zhao, H., Xu, B., Pu, J., Lu, A., Xiang, Y. Kattel, D.B., and Joswiak, D. (2012) Different glacier status with atmospheric circulations in Tibetan Plateau and surroundings. Nature Climate Change, 15 July 2012. University of Central Asia, Zoi Environment Network, Mountain Partnership, GRID-Arendal (2012) Sustainable Mountain Development Central Asia Mountains From Rio 1992 to 2012 and beyond. Accessed August 16, 2012.